Ann Arbor, for me, is best described by its neighborhoods: a tapestry of people woven together in brick and wooden homes, safe-guarded through the winter as wrapped and valuable gifts. As spring meanders into summer, as each present is carefully unwrapped, colorful jewels emerge, scattered about our town. Tucked between Packard Road and South Industrial, you will find one gem such as this; an eclectic neighborhood with chicken coops, a few dirt roads and lovely flower and vegetable gardens, some strung together and tended to by exceptional cooks. Do your lips pucker when you say “rhubarb”? Indeed, if you are brave enough to nibble at a stalk (the leaves should not be eaten), you’d find it tart and spine-tingling. But there is nothing like fresh rhubarb to balance the sweetness of desserts, sauces, jams and jellies. Rhubarb thrives in chilly locales, such as Michigan, and is one of the first garden edibles to appear after long winter months. 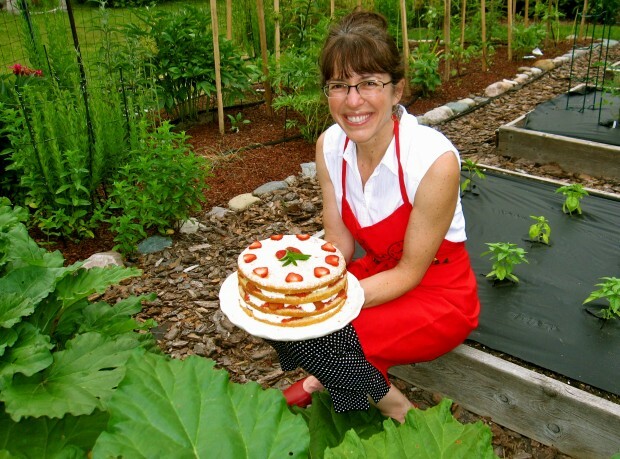 In September of 2009, Annamarie Asher shared with Ann Arbor.com readers her recipe for a Luciously Lemony Wedding Cake with Blackberry Sauce. She’s the personification of her cakes; sweet, but not overwhelmingly so; whimsical, but with down-to-earth goodness. The recipe below, bursting with the zing of rhubarb, the sweetness of strawberries and sugar, and the earthiness of freshly ground nutmeg, mirrors her sensibilities. Nutmeg is a seed from the fruit of a tree grown in the Spice Islands, and this cake is a recipe for nutmeg lovers, to be sure. Annamarie’s family and I love the pervasiveness of the freshly grated nut, but feel free to eliminate it from one or more layers if you’re not taken by its sultry appeal. The Strawberry-Rhubarb cake is far simpler to execute than the aforementioned wedding cake. The cake and compote be completed well in advance, and the recipe has been well-tested through the years. Annamarie, like other local gardeners, also grows heirloom tomatoes, chard, arrugula, mixed greens, cayenne peppers, green beans, nasturtiums and fresh herbs. The modest, charming garden blushes crimson under the setting sun, and my admiring gaze. The following recipe was adapted from Bon Appetit, May 1993. Butter two 9-inch diameter cake pans with 1 1/2-inch sides. Line bottoms with parchment. Using electric mixer, beat butter until light. Add sugar and beat until fluffy. Beat in eggs one at a time followed by vanilla. Sift together the flour, baking powder, nutmeg and salt into a bowl. Fold the flour mixture into the butter mixture. Gently mix in the milk. Divide the batter between the prepared pans. Bake cakes until firm to the touch, about 30 minutes. Cool cakes in pans on racks for 15 minutes. Turn out cakes onto racks and cool completely. Whip cream, sugar, vanilla and nutmeg until stiff peaks form, adding additional sugar for sweeter whipped cream, if desired. Combine rhubarb, sugar and water in a heavy medium saucepan. Bring to a boil and immediately reduce heat, cover and cook, stirring occasionally, until rhubarb is tender, about 5 minutes. Place one cake layer, cut side up, on a platter. Spread with 1/3 of the compote, then 1 cup whipped cream. Dust with powdered sugar. 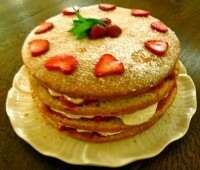 Arrange berries and mint sprig, if using, atop cake. *Make the cake as described above, but put all of the batter in one 12-inch spring form pan. You will need to repeat this so you have two, 12- inch cakes to start with. Double the cream and compote, making a bit more than double of the compote.